Perfect for quiet-time play or a rainy day, this set features four colorful animal puzzles. 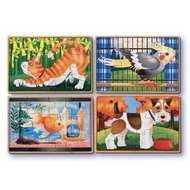 Sturdy wooden boxes store four 12-piece Pets themed jigsaws in separate compartments. Backs of pieces are shape-coded for easy sorting. Measurements 8" x 6" x 2.5".